When we think of Sade, many words come to mind. And, in addition to her still being just as beautiful now as she was thirty-plus years ago (seriously. It's like she doesn't age at all), one of those words is legend. We at DefineaRevolution.com would like to take a look at the group itself and its six official albums. In the early 1980s, Sade Adu sang backing vocals for a group called Pride. After Sade, Stuart Matthewman, Paul Denman and Paul Anthony Cook began writing their own material, they formed a group named after Sade. In 1984, Sade released Diamond Life, a staple of quiet storm and baby-making radio stations worldwide. Featuring songs such as "Your Love is King," "Hang On to Your Love," and, of course, "Smooth Operator," the group managed to make their mark on the first try. The album itself is classic and focuses on relationships, from both sides of the story. Additionally, Sade's silky voice floats on each track, even those which were very involved, creating an atmospheric feel before artists like The Weeknd and Frank Ocean revived it. I wasn't as big a fan of Sade's next album, Promise, on first listen. However, I was also probably 10 when I heard it. Going back, it's a project that acts as a sonic and topic-wise sequel to Diamond Life, for me, at least. "The Sweetest Taboo" and "Never as Good as the First Time" are masterpieces and layered so well. For 1988's Stronger Than Pride, all I've got to say is the title track smacks you in the face. It's a bit more Latin influenced than Promise, in some ways. But, it showcases the band's roots, since Pride was more of a Latin soul group in the first place. However, it does come to feel a bit like a retread of Promise in some ways as well. That could be because "Paradise" always reminds me of "Never As Good...," though. Something was, for me, missing from this album, though. I've never been able to put my finger on it. 1992's Love Deluxe is the album that many people in my generation, along with Lover's Rock, may go to when they think of Sade. That's not a bad thing. Look at the tracklisting. It's got "No Ordinary Love," "Cherish the Day," "Bullet Proof Soul," and others. However, the tracks I listed stand out more than the rest of the album. But, even though that's the case, the focus of this album, for me, is Sade's vocals. On Stronger Than Pride, it's kind of more about the instrumentation. It just misses being a classic for me, though. But, I'll say this. Many a baby have been made to this album. Some of you '90s babies, thank Sade. So, after four classic--or near-classic--albums, what does Sade do? They take a hiatus for about eight years. Sade took time to become a mother and be a mother, which is always awesome. Her bandmates, they helped Maxwell craft his sound. So, again, we have to thank Sade, in some ways, for something else: neo-soul. But, in 2000, all bets were off. Lovers Rock dropped. It dropped in an era where Sade's sound wasn't as hot. It was classic, sure. But, it wasn't exactly the big thing. So, what do they do? They go left, but still maintain that Sade-ness that made them a hit. They incorporated a wide variety of sounds and the result garnered Sade a Grammy for the album as a whole, a first. Oh, and "By Your Side" is amazing, end of story. Forget anyone who thinks otherwise. Following a 2002 live album from the Lovers Rock Tour, we didn't hear anything from Sade until 2010--eight years after. Now, Soldier of Love is a classic. But, it's known for something else. 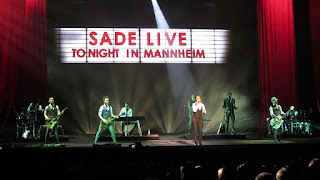 It's intro "The Moon and the Sky" was remixed in April 2011 for The Ultimate Collection, a Sade greatest hits CD. What's interesting about this remix is two things: Noah "40" Shebib handled the production on it and JAY Z recorded an official verse on it, marking the first time Sade herself collaborated with a rapper. This song--and Soldier of Love itself are testimants to the power of Sade, as a group and Sade herself. I mean, on Soldier of Love, there were moments where I legit got misty-eyed. When an artist or a group can still do that, still connect with you emotionally years after their debut, they're legendary.